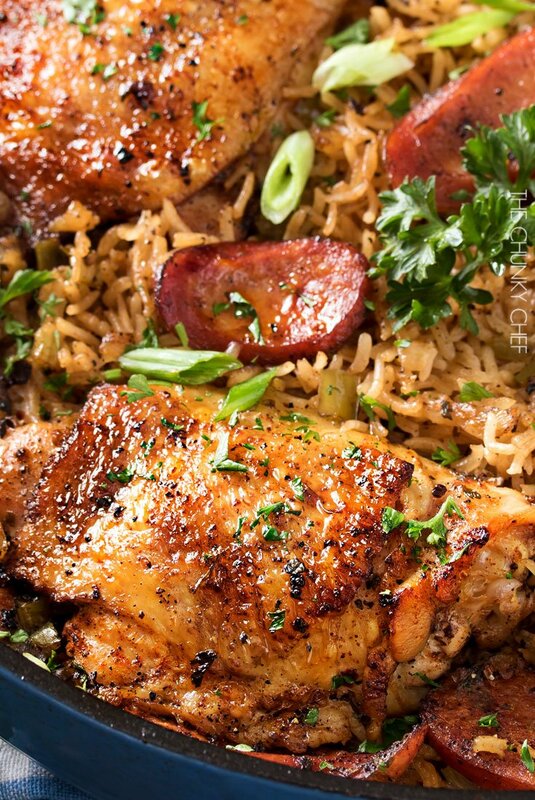 This one pot chicken and dirty rice is a dish washing hater’s dream! The chicken is cooked on top of the rice for the most flavorful dish ever! 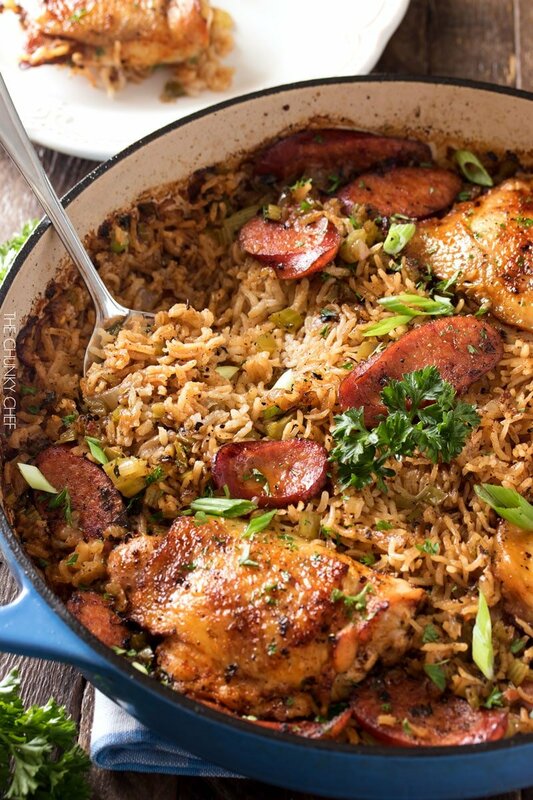 Amazing Cajun-style flavors collide in this one pot chicken and dirty rice! The crispy chicken, spicy andouille sausage and fluffy dirty rice… all made from scratch… make each bite a true explosion of flavor! Sooooo, dishes. Who hates ’em? *raises hand* The amount of dishes I do on a weekly basis as I develop and test recipes out for the blog… man, it’s just astounding. And thankfully, my husband is ah-mazing and washes the dinner dishes for me (I cook, he washes), but even so, I just despise them. That’s the second reason why I love this one pot chicken and dirty rice SO much. All you have to clean is ONE pot (well, plus the plate and mixing bowl). Yay for less pans to wash!!! 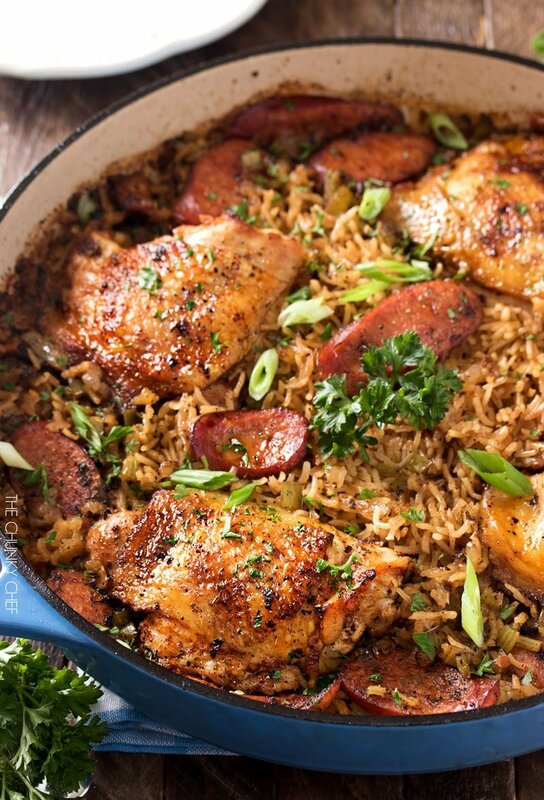 The first reason why I love this one pot chicken and dirty rice so much… is the FLAVOR!! Yep, that deserves to be in all caps, because it’s. just. that. GOOD! Even the leftovers will knock your socks off. There really aren’t any surprise or secret ingredients to make it so good, it’s more about HOW it’s cooked. The chicken and andouille cook on top of the rice, which means all the delicious juices go right down into the rice. It’s like cooking the rice in a super concentrated chicken stock full of spices! 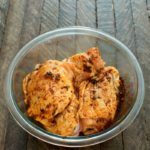 I used this cooking method from an amazing blogger, Nagi, from RecipeTin Eats, and just adapted it to these Cajun-style flavors! This is one instance where I realllllly love using my enameled dutch oven. There will be baked on bits of food that will probably need soaking (which you can’t do with a regular cast iron), and it browns food like a dream. I don’t have a fancy LeCreuset or Staub, but use my trusty Lodge pan… it works like a champ! This is the one I have. 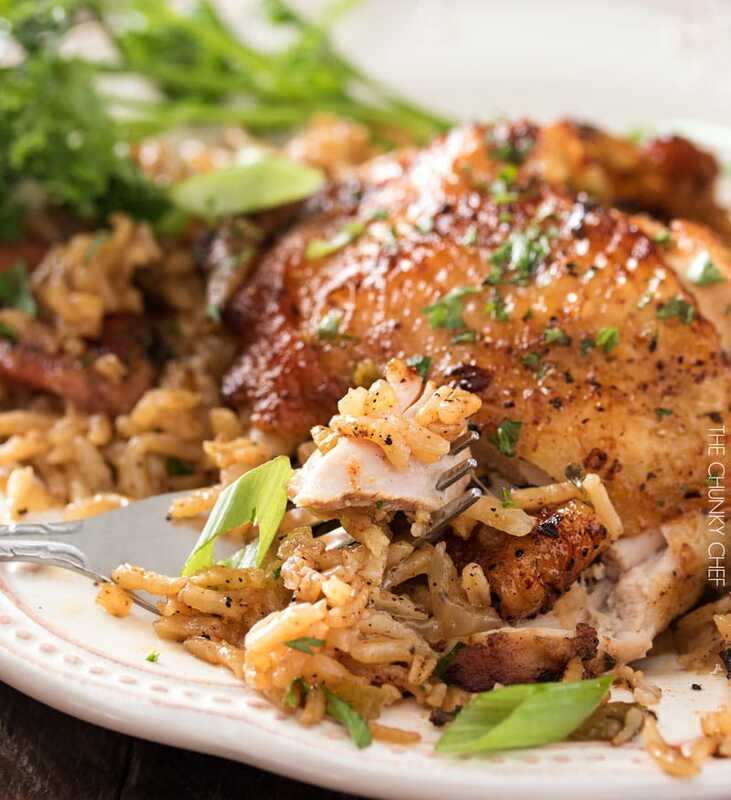 Give this one pot chicken and rice a chance this Fall… I really think you’ll love the Cajun-style flavors!! Simply put, you need this dish in your life! 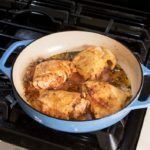 Lodge Enameled Cast Iron Braiser – This is my go-to pot for just about any dish like this… plus, cleanup is a dream! Long Grain White Rice – I really like this brand! 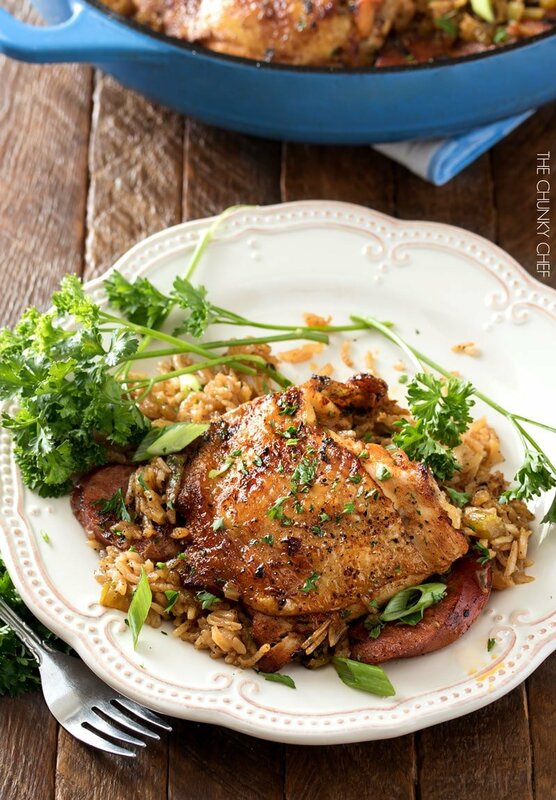 Chicken thighs are cooked on top of a homemade dirty rice, which makes for the most flavorful Cajun-inspired dish you've ever had! Plus, all you need is one pot! This was SO good, but the rice was kind of mushy, is it supposed to be pretty soft? I was hoping it had a little chew to it. It’s definitely tender, but you could cook it a little less if you prefer more of a bite. Glad you loved the flavor! This looks so delicious. DO you think it would work if i substitute with red meat? I haven’t tested it, so I can’t say for certain since all meats have different cook times. Happy I found your site. Just what I needed. I can’t wait to try this. This is a keeper! So delicious! I recommend doubling for leftovers! Easy and quick to put together, easy clean up and I almost always have these ingredients on hand. We’re not fans of spicy food so I left out the heat. I also continued cooking my chicken uncovered in the oven after searing it. Let the rice mixture almost fully cook and then added the chicken back in with it’s juice and cooked all together in the oven a few more minutes uncovered. Crispy juicy chicken and a flavorful chewy rice. Amazing! Made this by following the recipe exactly and loved it! Thank you! Would the recipe also work with just chicken drumsticks? This was SOOOOOOOO good can’t wait to try another recipe of yours! Do you have a dutch oven section? I’ve sent this several times and don’t know why it’s not showing up under comments? 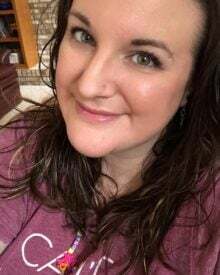 Hi April, we had to put our family pet down the other day, so I have been taking some time off. Comments have to be approved by me before they appear. Absolutely a delicious dish this is the second time I’m cooking it for my family. Love to add extra veggies bell pepper, kale, and carrots. I have a young one of my family so I do not add the jalapeno seems to be enough spice with all the other spices added. I also use jasmine rice super yummy turned out both timed. I’m so glad you all love this dish! I haven’t tested this recipe with brown rice, only as written, but I think it would be okay with the same liquid amounts. The brown rice should take about 1 hour and 15 minutes covered, and 10 minutes uncovered. Since the chicken is cooking in the liquid, it shouldn’t get dried out, but you could always add the chicken partly through the covered cooking process if you’re worried about it. Excited to be trying this tonight! Honestly I came across this recipe on Pinterest and made it because I had the ingredients. When it came out I was AMAZED on how delicious the rice was. I wasn’t super happy with how the chicken came out so I think next time I’ll cook it on the side my way, but over all I give this a 5 star rating. We like heat so I doubled the jalapeño and cayenne pepper and man, this really hit the spot. Took everything in me to not eat the whole thing before my husband got home. Excellent, adaptable recipe. The first time we made it, for a crowd, we made the non-spicy version and it was a huge hit. Very flavorful even without the hot spices. Highly recommend letting the chicken marinate with the spice rub overnight, and adding a couple of bay leaves to the pot with the rice. The second time we made it, for ourselves, we tried the spicy version and found it too spicy for our taste (and we tend to like spicy food!). 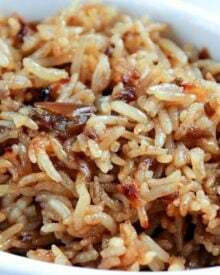 I also substituted basmati for long grain rice because I prefer the texture of basmati. In the future we’ll cut the spicy ingredients in half and I bet it’ll be perfect for us. I made this many times, I love it. I find it a little bit spicy, so I only add half the spices. The chicken really needs to be seared first, then cooked in the oven. And I made this already a few weeks ago and my husband and I loved it!!! So so good!!! Thank you!!! Hi, I am confused between step 11 and 13, how long do you let it simmer (with the cover) on top of the stove before you put it in the oven for 35 mins. I’ve never used a dutch oven but I am going to buy one. This looks delicious!!! 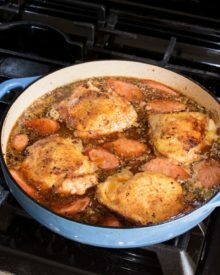 You don’t have to let it simmer for a certain amount of time, you just have to bring it back up to a simmer before adding it to the oven 🙂 I hope you love dutch oven cooking, it’s amazing! FYI, this in No way dirty rice. Dish looks tasty but not even close to dirty rice. Thank you, but I never claimed it was authentic in any way. Just wanted you to know your appreciated!! Excellent site, dynamite recipes, delicious food.. Keep rocking it!! Made this last night. OMG it was so good! Thank you for this recipe! Made this recipe and it turned great! Was wondering how you could double or even triple servings? I’d like to make for a party. I’ve made this recipe several times and I ABSOLUTELY LOVE IT. I want to bring it to a work potluck and keep it warm. My thought is to cook it and then transfer to a crock pot and set on warm until the potluck. Do you have any tips for me? So, just in case anyone is looking for it- this recipe doesn’t keep well in a warm crock-pot. The rice changes texture. I would recommend keeping it in the fridge and reheating just before serving. Fantastic recipe!! 2 nights in a town using one of your recipes and both were 5 stars! Easy to follow and super tasty! Thank you for posting this! I made it last night and it was great – the husband raved. cajun spice mix and chicken breasts that I had on hand, as well as brown rice – it turned just fine. I will be making it again. I’ve made this dish several times now and it’s always a huge hit! We are going camping for Thanksgiving and I’d like to make it one night for the group; but oven space is at a premium in travel trailers. Do you have some suggestions for finishing this in a crock pot? So glad you love it!! I’ve never done it in the slow cooker… but it might work. What I would suggest is to brown the sausage and chicken, and cook onions and peppers as directed. Then move all the rice components, including the chicken stock, to the slow cooker. Lay the chicken thighs and sausage on top of the rice, cover and cook on LOW for 2-3 hours. I would check on the rice about halfway through cooking and see how it’s doing. If it’s dry, add a splash of chicken stock. You may have to play around with times, since all slow cookers are different and I didn’t develop and test this version myself. Good luck! This is one of my favorite meals! Thank you! Any suggestions on making it Keto friendly? Want to sub out cauliflower rice but don’t know if I can cook it as long or if I should cook separately. Please help! I haven’t tested this recipe with cauliflower rice, but to be on the safe side, I would probably cook it separately. Hi! Could I use chicken wings? Hi Teana… I’m sure you can, but I can’t say for certain how long they’ll take. Made this last week when I hosted a Monday night Football Game. It came out delicious!!! Can’t thank you enough for sharing this fabulous recipe. One of my hardest critics commented “this is the best”. This was a great recipe! Very easy to make. We did a little twist on it because we do a lot of freezer meals. We had some shredded chicken with celery and carrots in the freezer, as well as some home mode Chicken/Vegetable stock. We substituted the sausage with bacon and followed the rest of the steps of the recipe before adding our shredded chicken. Then to top it off we added some caramelized onions and mushrooms. I made it a little heavy on the spicy side, so next time we won’t add jalapenos with the seeds. My whole family liked it, which is a big deal, because with 4 children under 11 years old, we have quite a few that are picky eaters. Look forward to trying other of the recipe’s you have shared! Tried this last night. I made a few changes, so this isn’t a review of this recipe, per se, but for the general idea. Instead of making a spice mix for the rub, I just used Badia Cajun seasonings mix. After browning the chicken, I tasted a little of the spice, and I found it quite spicy, so I left out the jalapeno pepper AND all the other seasonings. This made this a very easy dish to prepare. I also had 9, yes 9 chicken thighs. So I doubled the rice and used 2 cans chicken stock (which is about 4c). It came out really yummy, and the family said that it was a winner. Not a weeknight meal for me (due to the 45m of cooking AFTER the ~30 prep), but maybe on a Sunday and have leftovers for the rest of the week. So this dish is cooked in a pot but in the oven? Is that correct? Hi Dee 🙂 Yes, you’re correct. Starts on the stovetop, finishes in the oven. This recipe looks amazing! Unfortunately my dorm room doesn’t have an oven, only a stovetop. Do you know if/how the recipe can be adjusted to be made completely on the stove? Hi Gracie 🙂 I’ve never tested it, but here’s how I think it could work. Complete through step 12 of the recipe. 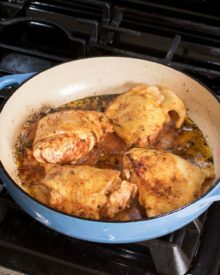 Instead of baking it in step 13, cook on Medium Low on the stovetop for about 15-20 minutes, or until liquid is reabsorbed and chicken is cooked through. 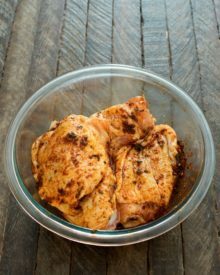 I’d probably use skinless chicken thighs, since the stovetop method won’t get the skin on the regular thighs crispy. Hope you love it! What happens on steps 2 and 12? The recipe card populates those images as steps, when they’re really not. They’re just showcasing the written steps. Hi I wanted to know could you use skinless chicken breast for this recipe instead of chicken thighs? Hi Tan 🙂 Chicken breasts won’t be as tender or juicy, but if you wanted to use them I would skip adding the chicken before baking. Go ahead and add the sausage on top of the rice mixture and bake it covered for 20 minutes. Then add your chicken on top of the rice mixture, re-cover, and continue baking for the rest of the 15 minutes. Then uncover and bake as directed. Can you use chicken breast instead of chicken thighs? Yes, absolutely! They may cook a little faster though. 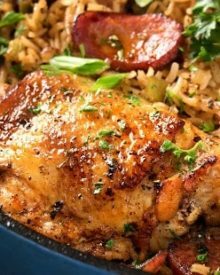 Thank you for posting the One Pot Chicken and Dirty Rice recipe which I plan on making this evening. I do have a question regarding salt content: the recipe calls for “salt and pepper to taste” which doesn’t really help me out. I am using a custom blended sausage that is exclusively produced for a local eatery, “The Jambalaya Shoppe” which doesn’t have a strong salt presence and with locally grown rice, I will add approx. 1 teaspoon of salt to the rice, chicken stock is a low salt version as well. Would you recommend an additional amount for the remaining mixture? Hi Bobby 🙂 I say salt and pepper to taste, as everyone’s sausage will have different salt contents, and people have different tastes in regards to how salty their food is. I would add the 1 tsp, and when it’s finished cooking, taste some and see if you think it should be saltier. If so, add more. Is the one cup of rice in this recipe a rice cup or a standard measuring cup size? I made this for my extended family 5 adults, 4 kids (2 of which are fussy eaters), EVERYONE loved it!! We will definitely be making this again! 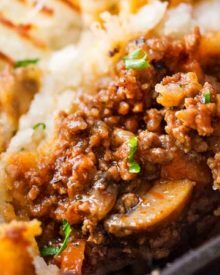 Thank you for such a wonderful, well thought out recipe…so much flavor, so much fun and a perfect one pot dish that impresses the guests! Note: We followed the recipe as is except that we added yellow bell peppers (cut into large squares) and some prawns! Hi Cindy 🙂 No need to fry the rice, although you certainly could… but cooking just as the directions state will result in fluffy rice in the end. Looks AMAZING! 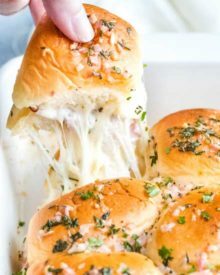 Can’t wait to make this, especially after reading all the glowing comments! I was wondering if you could freeze this meal?? Hi Julia 🙂 I’ve never tried to freeze the recipe, so I can’t say for certain if it would work. This was so easy, and so, SO good. I like my food salty as heck so I added extra salt. At first I thought the chicken by itself was a tiny bit bland, but then when I took a bite of everything together it was PERFECT. Thank you so much for this recipe!! Mahalo Nui Loa for the Chicken and Dirty Rice recipe. It’s fantastic! 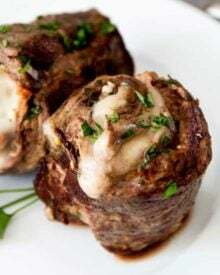 I love this recipe and am making it for the 2nd time tonight! Can you tell me if the calories listed are per serving? Do you have any other nutritional info you can share? I’m currently tracking my points and it would be so helpful! I don’t usually comment online but I had to because my husband and I have made this twice in two weeks and we absolutely love it!! The cooking time was a bit longer for us–I think because we used long grain brown rice, so we adjusted the second time around. And I’ll put smoked paprika in anything that calls for spice so we did that too 🙂 A really delicious recipe, thank you for posting! I received an enamel pot like this at my bridal shower, nearly 8 years ago and have never used it. Mine is much deeper though, and I’m wondering if this will work for this recipe. I don’t cook much, but it’s one of my goals this year. Hi. I am wondering if all but the baking can be done ahead of time. Hi Cheri, I’ve never tried that before, so I can’t say for sure. Oh ya, this is a keeper! Made this last night. Didn’t have smoked sausage, but it didn’t matter. Used green pepper, onion, and mushroom for the veges. 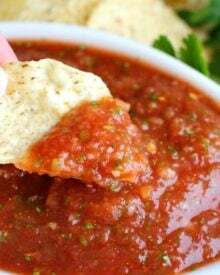 So easy, and unbelievable flavors!!! DELISH!! Hub loved it too. I made this dish Saturday night and its absolutely delicious and so easy to make, my husband can’t wait for me to make it again. However, I can’t find Andouille sausage anywhere so used Chorizo which was tasty. Delicious! I halved the recipe and it was so good. Simple, not time consuming but. packed with flavor! Seldom do I leave reviews, so obviously it was that good! I have doubled this recipe and it worked perfectly and it was so delicious. I am making it again (doubled) this Saturday..it will perfectly for our family, boyfriends & girlfriends of our kids. Going downtown to our tree lighting ceremony then back here for dinner and tree trimming. This dinner is easy and the whole pot of chicken and rice will feed our crowd and all I have to do is make a veggie and we are all done and off to decorate our tree! Thanks for this tasty recipe! I recently retired but the wife still works so I have moved beyond my outdoor smoker and started cooking in the actual kitchen! Every week I give my wife a few options that I find online and let her pick one. This one has become her (our) favorite! She works from home and the smell in the afternoon gives her something to look forward to. I just wish I could do more chicken in the same pot but I fear it just wouldn’t be the same. Time to start on the Andouille, later……. I made this dish tonight for my family. It was a hit! And only one pan to wash, Even better! We like spice in my house. I used chilli peppers from my garden instead of jalapeños and I marinaded the chicken over night. This was an easy dish to prepare on a weeknight. Thanks for sharing! I made this dish tonight after drooling over the photos for the last two days. Made it exactly as listed and MAN, I was not disappointed! Very flavorful. This was a big hit with hubby too, and not just because there was only one pot to clean afterwards. He commented several times how much he liked it. We will absolutely be adding this one to our regular rotation. Thanks for the inspiration! This was so good. Left out the jalapeno peppers and used bell peppers and fresh garlic instead. Also cut down on calories using skinless thighs and chicken tenders. I had a wild rice and quinoa blend on hand so used that. I loved this dish. Full of flavor..will make again using shrimp! Made this today. Used two jalapeños. Was delicious!!! Hello! So i am making this this evening and wanting to make sure mine doesnt turn out horrible like the one lady whose did. i am going to use a cast iro pot and i am going to double it as well but do you have any suggestions for making sure its cooked thoroughly in a cast iron skillet? Hi there 🙂 I don’t normally double it for my family, so I can’t say for certain, but I think you’re making a great choice with the cast iron pan. Cook it as directed, but check it towards the end and see how the rice is cooking. It may need a bit more time since the amount is doubled. Hope you love it! Hi Avery, I wouldn’t recommend it, since I think the uneven depth of the pan would make for parts of the rice being cooked and parts being crunchy. Didn’t read through all the comments but curious as to why/how some couldn’t double it. I double it all the time and it cooks in the same amount of time (I use a bigger pot so I can have the chicken in one layer). Most rice recipes use 1c of uncooked rice so when I want more, I cook 2c. Just adjust the liquid. For those who don’t know, for 1c of rice, use 2c of liquid (so 2c of rice use 4c of liquid). You might need to adjust by 1/4-1/3c depending on whatever else you have in the dish. But that almost always works for me. Can I cook this in a crock pot? This looks amazing! I’m gonna try this very soon. Hi Brian 🙂 I’ve never done it in the slow cooker, as it’s designed to be a one pot stovetop/oven meal… but it might work. What I would suggest is to brown the sausage and chicken, and cook onions and peppers as directed. Then move all the rice components, including the chicken stock, to the slow cooker. Lay the chicken thighs and sausage on top of the rice, cover and cook on LOW for 2-3 hours. I would check on the rice about halfway through cooking and see how it’s doing. If it’s dry, add a splash of chicken stock. You may have to play around with times, since all slow cookers are different and I didn’t develop and test this version myself ? Good luck! I made it just like the directions. With a few exceptions. I used more water towards the end to keep the rice from drying out. I did not bake it. Just used a cover on my pampered chef pan. My chicken was boneless skinless thigh meat. I used chicken base instead of broth. Still so flavorful. I will make this again and highly recommend it. I have madr this before and everyone loves it. I was sitting thinking abaout what tonight’s dinner would be and thought about this. I think I’m going to add in some sauteed shrimp at the last minute and roasted brocolli on the side. Thanks for a delicious and quick meal!! OMG this dish is so awesome!!! Making this for the second time tonight and im excited!! I used boneless thighs because it is what i have on hand, but WOW the flavors here are impeccable!! Thank you for this wondeful dish! 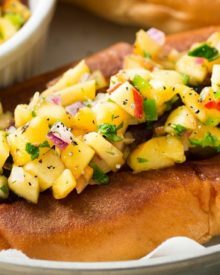 Tried this last night-this recipe is delicious! Hi Eva 🙂 I’m SO happy to hear you both loved the dish!! Any chance you have the nutritional values for this recipe? Made this for the first time a few weeks ago, and I can honestly say that I think it’s one of the best meals I’ve ever cooked (and I’m 50 years old and no slouch in the kitchen!) Even my food-sensitive and very picky autistic son came back for seconds. Luckily, spicy is something he likes – I kept the seeds in the jalapeno, and increased the cayenne & red pepper flakes. 🙂 I made it in a 5 qt enameled dutch oven, and it was perfect. I think for the summer I’m going to grill the chicken (I marinated overnight and the flavors were wonderful) and the sausage, just to give it some extra smoky flavor. the recipe and I am most sure that Nagi appreciated your comment. Cook the chicken completely on the stove, set it aside and cook the rice on the stove (reduce the liquid by 1/2 cup). Just follow the recipe directions up to the point just before putting it in the oven. Instead of doing that, put the lid on and cook on medium low until the liquid is absorbed (about 12 – 15 minutes). When the rice is almost ready, put the chicken back on top of the rice and put the lid on to warm up, and finish cooking the rice. Awesome recipe. Today was the first time I made it. I did cook 8 thighs but the only thing that I did different was when the recipe called for adding the chicken to the rice I opted to grill it while rice and sausage cooked. It turned out fantastic. Will be making this again! Thank you! Making this for a fourth time for tonight’s dinner! Soo delicious. I wonder if adding a can of red beans to this recipe along with the rice would work? My husband’s idea actually. What are you thoughts on using pork chops in place of the chicken? I’m going to give it a try as it’s the exact style of recipe I’m looking for! Hi Jana 🙂 I’ve never done it, but I think it would work well! Just had this dish……Outstanding…I added some sausage and crimini mushrooms…Thank you so much….The flavors just popped…I went for the heat. Found this via Pinterest, and wow, it looks incredibly delicious and I need it in my life now! I’m not a fan of chicken thighs, but I would love to use chicken breasts, or even wings. What would I have to change in this recipe to make that happen? Made this tonight and the whole family loved it. I used boneless, skinless chicken breast and brown rice. I added 1/2 cup more broth since I was using brown rice and cut the cooking time down to 20 minutes covered and 15 uncovered. Also cut the cayenne pepper in half. This is definitely a keeper in our house. Thanks for sharing! This was delicious! My husband and I loved it. Just need a quick clarification: On step 10, adding the rice and chicken stock, it says to let simmer for one minute. Since the pan was on med-low, there wasn’t really any simmering. I kept it at one minute and everything cooked all the way through, but I was wondering if I should have let it come to a simmer, then gone on to step 11. Thanks! I made this the other night and it was a hit! I did attempt a different version as I used brown rice, which I usually make in the rice pot. I did try cooking it on the stove top a few minutes longer and in the oven longer but the rice still had a “bite” to it. Lesson learned. I’ll use the white rice next time. Hi Lisa 🙂 I’m so happy this recipe was a hit!! Brown rice can certainly be tricky to substitute, glad you enjoyed it anyway! After reading some of the requests and comments, I gave the recipe a try and made some changes to it that I thought worked fairly well. I do not have a crock pot as I have a flat surface stove and cast iron cookware doesn’t work that well for my environment. I do, however, have a 3.5qt large bottom ceramic non-stick covered pan that I use frequently for one-pot dishes, and some glass and ceramic bake-ware. Used 4 boneless chicken breasts cut into halves. When you add the rice, do not add back the chicken and sausage yet. Leave the rice mixture in the pot, bring to a boil, and the reduce to a simmer. Cover promptly and leave alone for 18 minutes. Bake the chicken and sausage at a reduced oven temp, say 275, while the rice is cooking. After 18 minutes, check the rice for tenderness. You may need to had a 1/2 cup of broth for evaporation. (I did). Its ok if the rice is a little on the tough side as we are going to bake it for 15 minutes. Remove the chicken and sausage from the oven and set to 350. While the oven is heating, turn off the stove, but leave the rice covered. Transfer the rice mixture to a 13×9 oven safe dish (or similar volume). Sooth out the rice and arrange the chicken and sausage nicely on the top. Bake for 15 minutes, and then garnish. I made no other changes to the ingredients. I must say this is a very tasty dish! My hats off to the Chef! For those who wish to increase the volume, adjust your broth to rice ratio accordingly. Also adjust the spices slightly to account. You may wish to use the stove top method described above as it gives better control of the cooking of the rice. Hi Janet 🙂 I’m so happy to hear that you and your husband loved this one pot dish as much as we do!! I made this for dinner tonight and it was FANTASTIC! My husband had seconds, which is saying something! I did omit the extra cayenne & red pepper that is added along with the rice, just because I wasn’t sure how hot the end product would turn out. It still had a small kick to it (coming from someone who does like spicy). Next time I’d add even more andouille. There will definitely be a next time! 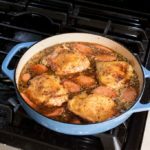 What size of Dutch oven/enameled pan did you use? Can I use chicken breasts instead of thighs in this recipes? If so, how many? Hi Ann 🙂 I’ve not made it with boneless chicken breasts, as we love the juicy flavor of the thighs… but I’m sure you could substitute breasts. I would do as many as you can comfortably fit in your pan, probably 3 or 4 (depending on their size). I hope you love it! Made this for supper tonight. Doubled the recipe to feed my family. Instead of adding the chicken back into the pan, I put the rice and chicken into a baking dish. Cooked it for 10 mins longer than the recipe called for and it turned out fantastic. A bit spicy even though I didn’t at the jalapeño pepper. My step son had 3 servings!! We definitely will be making this again! Thank you for the delicious recipe! This looks delicious!! Is that 1 link of sausage? thanks! Hi Janet 🙂 Thank you! Yes, 1 link of sausage, unless you’d prefer more. Hi Sandra 🙂 So happy to hear you enjoyed it! Made this for dinner tonight and it was delicious!! The boyfriend devoured it even before it had time to cool down. I cooked it on the stove top though because I don’t have any oven safe cooking pots yet. I also added a frozen pea, carrot and bean mix in for some extra veg. It worked wonderfully. Definitely saving this recipe!! I was planning to try this tonight. Based on the comments, do you recommend NOT doubling the recipe, or will it just take longer to cook? I have boneless, skinless thighs on hand. Could I use them instead or should i go to the store and get skin on bone in? Thanks! Hi Stacey 🙂 Yes, you can use boneless skinless thighs, just put the chicken in the pan 20 minutes into the baking time (since it won’t need to cook as long without the bones). I can’t say for certain whether it can be doubled… as I’ve never done it, this meal is plenty for our family of 4. For the comment above, (without knowing the type of pan, if everything was followed correctly, type of rice used, etc), doubling it was the the only variable I could think of that would cause the recipe to turn out like she said it did. I hope you love it as much as we do! Thank you! I’ll let you know how it turns out! It’s Arielli again. Thanks for the tip i’ll do that! One more thing, not sure why I’m experiencing this on this recipe but I bookmarked this page and every time I load it, it takes me straight to the bottom of the page (btw I’m on an iPhone). I bookmarked other recipes on your blog and when I load them it takes me to the top of the page, as it should. Not sure if this is associated with the particular setup of this page or if others are experiencing the same issue. Hi Arielli 🙂 You’re welcome! It’s because somehow when you bookmarked it, it saved it with your comment as part of the url… I’ve done this myself a few times on other websites. I want to add (tail on) shrimp next time, when do you recommend I add it? I imagine I won’t have to precook it ? Hello. I came across this on pinterest and happened to have all the ingredients on hand so I made it for dinner for my family last night. I doubled the recipe since I had 8 chicken thighs instead of 4. I have a large cast iron pot so everything fit in nicely. It came out awful. Not only did it take 40 minutes longer to cook than the recipe stated, if I hadn’t check on it and stirred the rice often ( I had to remove the chicken thighs, stir the rice, then replace the chicken) it would have all been uncooked instead of just some of the rice. The rice towards the bottom of the dish was mushy and the rice at the top was still uncooked. I went by the chicken internal temperature for my cooking time, and there was so much oil and grease that the partially cooked mostly mushy rice was inedible. The seasoning on the chicken was good, I think next time I will cook the chicken and rice separate. This looks incredibly delicious!! I’m marinating the chicken now. My question is can it marinate overnight? Our friends surprised us by taking us out to dinner so I was going to make it tomorrow. Is that OK? Could this be done in a crock pot, and if so how would you suggest doing it? Hi Shannon 🙂 I’ve never done it in the slow cooker, as it’s designed to be a one pot stovetop/oven meal… but it might work. What I would suggest is to brown the sausage and chicken, and cook onions and peppers as directed. Then move all the rice components, including the chicken stock, to the slow cooker. Lay the chicken thighs and sausage on top of the rice, cover and cook on LOW for 2-3 hours. I would check on the rice about halfway through cooking and see how it’s doing. If it’s dry, add a splash of chicken stock. You may have to play around with times, since all slow cookers are different and I didn’t develop and test this version myself 🙂 Good luck! Has anyone tried making this dish in a different pot than the one she mentioned? Any success? I don’t have the one she uses. This looks so good! Thanks for the recipe! Do you think I could make this in a crock pot? Any suggestions for a crock pot version? Hi Joelle 🙂 Thank you! I’ve never done it in the slow cooker, as it’s designed to be a one pot stovetop/oven meal… but it might work. What I would suggest is to brown the sausage and chicken, and cook onions and peppers as directed. Then move all the rice components, including the chicken stock, to the slow cooker. 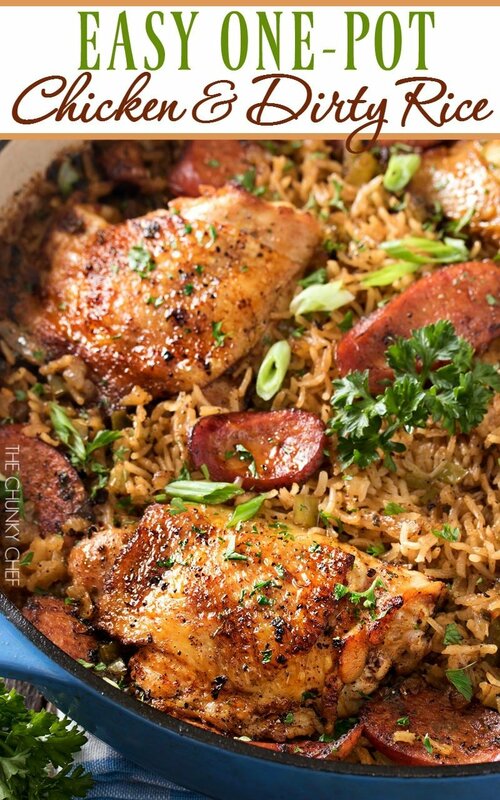 Lay the chicken thighs and sausage on top of the rice, cover and cook on LOW for 2-3 hours. I would check on the rice about halfway through cooking and see how it’s doing. If it’s dry, add a splash of chicken stock. You may have to play around with times, since all slow cookers are different and I didn’t develop and test this version myself ? Good luck! I use Nagi’s method as well!!! It really is the best isn’t it?!? And ummm this…this is gorgeous. the colors the textures! Everything is ridiculously stunning! 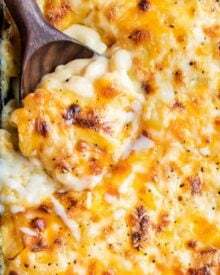 Made this last nite and my bride gave it 10+ stars Would love to see more “One Pot” recipes. Thank you sooooooooooo much. This looks just perfect to me! Gosh, when it comes to dishes I sometimes feel like the huge pile in the sink is like a never ending story! I wash them, dry them and put them away and there it’s time to make another dish again lol! I cannot believe something this delicious can be made in just one pot! What a great looking dinner!! This dish looks seriously tasty. 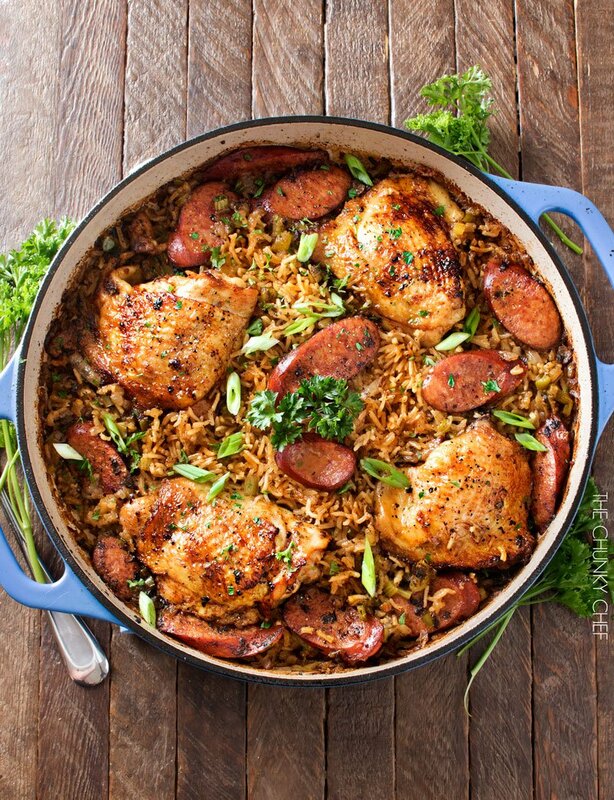 I love all that fluffy rice, sausage and chicken…in one pot! I’m lucky, my husband normally does the dishes after dinner so I know he’d appreciate this meal for more than one reason. I’m raising both hands! And seriously, you can just see the flavor in this dish, it looks incredible. Adding to my “dinner” bookmarks! The perfect weeknight dinner!! It looks incredible!! I am a weirdo and don’t mind dishes, lol. Everyone is floored I do not touch my dishwasher! But my hands sure hate me. I can definitely stand behind this meal if it will save me some time! Plus I know my family will love it! I seriously cannot get over how delicious this looks. Seriously unreal!